Hello this is Crystal Hendrix from Hendrixville to present you another tutorial. 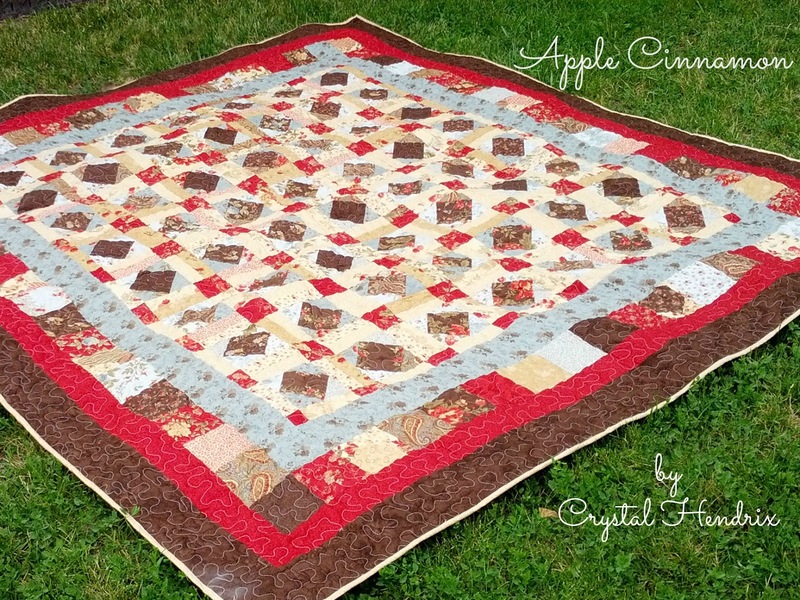 Here is a fun queen size quilt that would look good in any color combinations! I hope you enjoy! This version is perfectly lovely for Christmas in July. Warning: Everyone knows that when you get pregnant your brain does funny things…thus I have a pregnant brain and if something does not make sense please let me know and I will try my best to explain and help you all that I can! This quilt is made up of a set of 56 blocks that is then surrounded by 4 different borders. At any time you can subtract a row or column of blocks or even a layer or two, but know that it will not then coordinate with the instructions below. While sewing make sure that you use a 1/4″ seam line through out the whole quilt. With blue fabric cut 7 strips of 4.5″xWOF. With your layer cake pieces you will need to cut it into 4 pieces to create a charm piece (5×5″). You will need 68 charm pieces or 17 layer cake pieces. 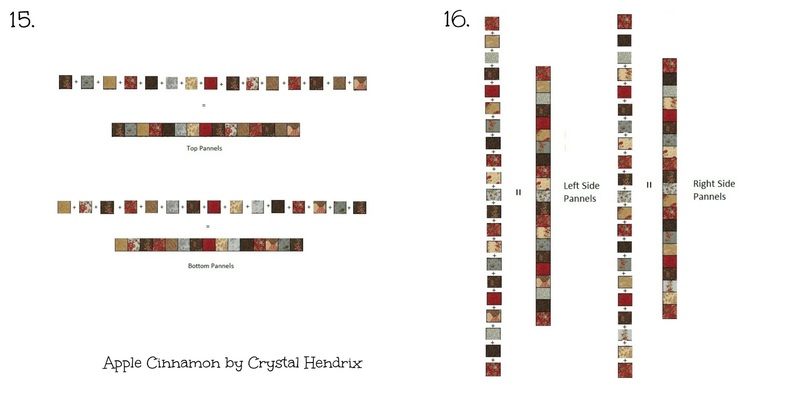 You can choose a random pattern or you can cut according to make a color coordinated pattern. You will use two sets of 15 (top and bottom) and two sets of 19 (left and right sides). With the red fabric cut 9 strips of 3.25″ x WOF. With brown fabric cut 10 strips of 5″ x WOF. Now lets begin assembling our blocks. You will need to make a total of 56 blocks. I like to lay out my blocks so I know what they are going to look like, so #1 lay how your block. 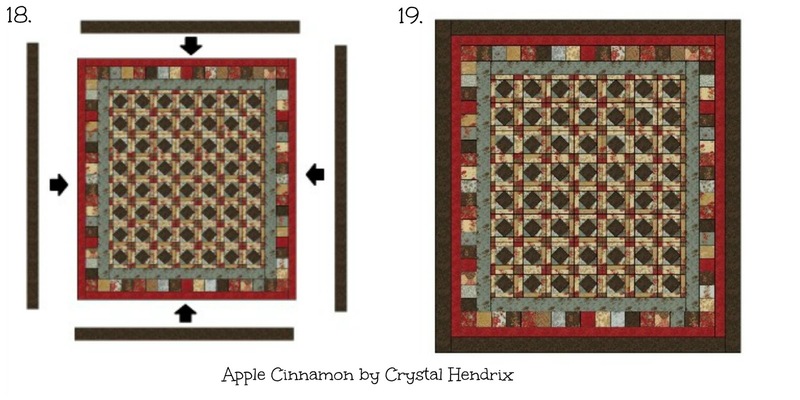 This will help you get the desired look of your block and will allow you to make any color patterns that you would like (I did not use any pattern but did a random pattern). #2 Pin two of your blue triangles to each side of your block. (Tip: fold your block into 4 so you can find your center mark – this allows you to line up your points easier). #3 Sew each triangle on to the sides and then press seam. #4 Grab your other two diagonal blue pieces and #5 pin them to your block and then #6 sew them on and then press seam. I like at this point to trim up my newly made squares, so that the next steps go easier. #7 trim your squares to measure 6 x 6″ (Tip: when trimming make sure that you measure a 1/4″ from the point of the brown square, this will allow your points to be lined up perfecting when adding the border pieces of the block). 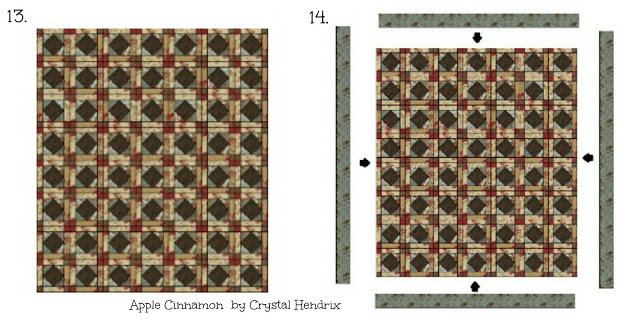 #8 Lay your block out now and then #9 sew the top, middle and bottom pieces together and press seams. I lay them back out afterwards to make sure that I did it right (believe it or not, I do mess up in this area more often than you would think). #10 Now pin your pieces together (I like to do it at the seam lines, this allows it so that my seams all line up and match), sew and press. #11 Now trim your blocks to a 9 x 9″ block. (Please forgive this picture, when editing I though it was a picture of the finished block I was using – so imagine that this block has the border pieces on). #12 Finish making the other 55 blocks. Now it’s time to assemble the quilt! When assembling my quilt top I did a random order, I just grab a block and added it. If you are doing a random order, this eliminates laying it all out and then labeling rows, but do whatever you desire. #13 Sew and press your 56 blocks into a 7×8 block pattern. So this is 7 rows of 8 blocks or 8 rows of 7 blocks. I sewed all the rows together and then added all the rows together. Make sure you press all your seams as you go. #14 Now with our first border we will now sew together our 7 strips of blue to make 2 sets of 4.5 x 60″ and 2 sets if 4.5 x 76.5″. Now the shorter sets are sewn to the top and the longer sets are sewn to the sides. Press all seams. For the second border we are using layer cake pieces that we cut into charm pieces. I did try to do a color pattern and it does line up properly but if you are going to do a random order feel free to do so. #15 Sew two sets of 15 charm pieces. The colors shown above is the color pattern I used. Just make sure that you keep your bottom and top separate as it will make a difference. #16 Sew together 2 sets of 19 charm pieces. Once again these are the color patterns I used and again make sure you keep your left and right sides separate and labeled if you are using a color pattern. You don’t have to use my color pattern but can create your own. #17 Making sure that you have your sides separated, add the top and bottom first then your sides. I like to pin my charm sets the quilt top so I can line up my seams as well and make sure that I line up the border correctly. #18 with your third border take your strips and make 2 sets of 3.25 x 77″ and 2 sets of 3.25 x 91.5″. Sew the shorter pieces to the top and the longer pieces to the sides of your quilt top. Make sure you press your seams. Once again you can see that my editing skills are lacking. So we will continue on with #18 – but make it part b! 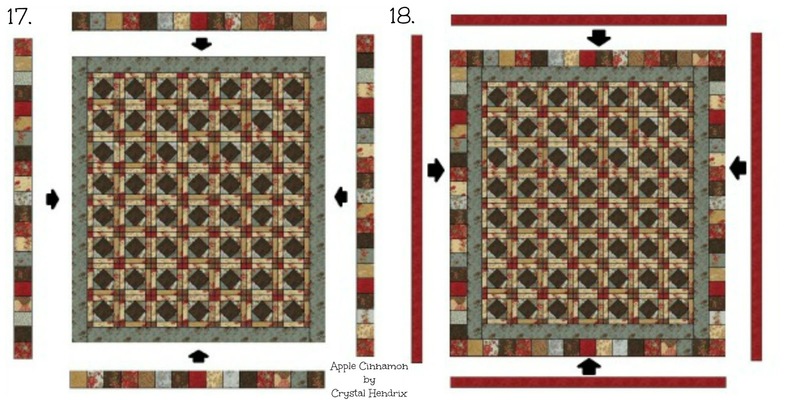 With your fourth and final border make 2 sets of 5 x 82.5″ and 2 sets of 5 x 100.5″. Once again sew the shorter sets to the top and bottom and the longer pieces to the sides. Press your seams. #19 Your quilt top is now finished! Baste, quilt and bind as desired! 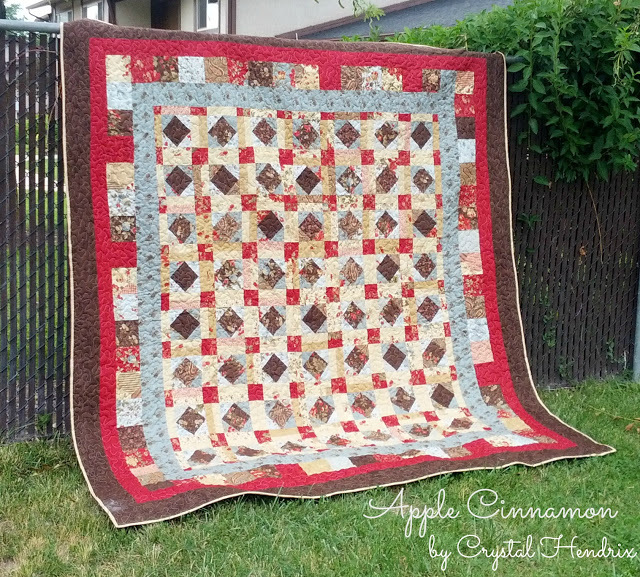 When you are finished you will end up with a queen size quilt approximately 91″ x 100″. I consider this to be my modern take on this type of block quilt. Some may say otherwise but to me, it is more modern. This will look amazing on the back of your couch that you can grab when you want to snuggle while watching a good movie or read a good book. It will also look amazing on your bed! If you have any questions please let me know! I am fully aware that I am not perfect and appreciate any pointers that I made a “goof”. Enjoy! 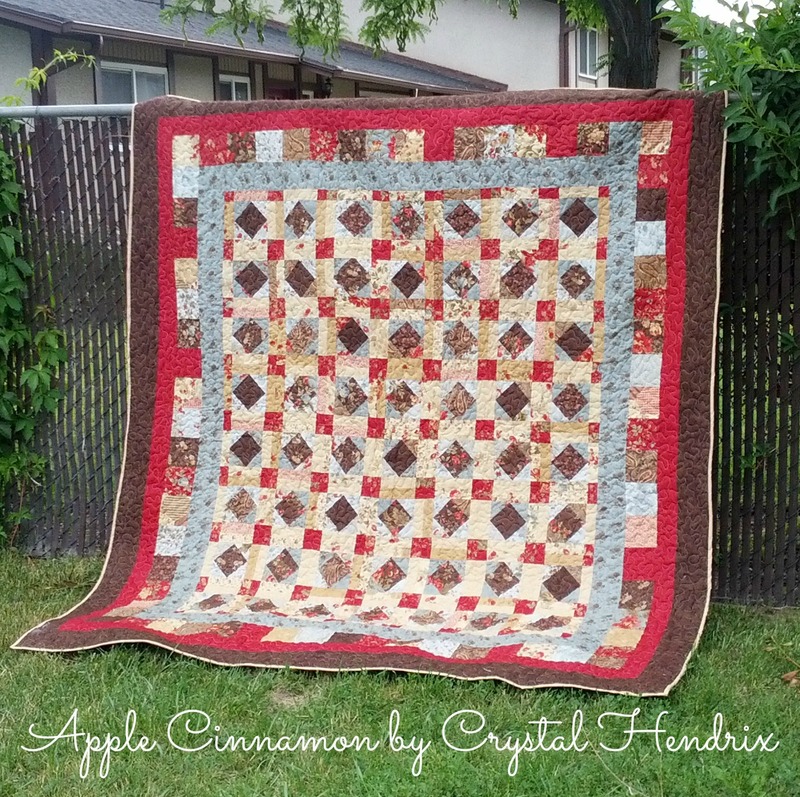 This entry was posted in Ambitious, Charm Pack, Layer Cake, Quilt, Seasonal and tagged 3 Sisters, Christmas in July, Double Chocolate, Queen Size.